I saw a guy outside the Cal Neva and he said it was his last day of pitching cards as he fanned a deck towards the moon. Something about the primates on the upper deck! Randy S.
It has been just a day short of a quarter-century since I dealt my last hand at the Cal Neva, but thank you, Randy, for allowing me to reminisce on some of the great times I had in gaming. The upper deck reference is the Club Cal Neva’s Top Deck: If I penned a narrative about the cast of characters who haunted the Top Deck 24/7, most would believe it couldn’t be anything but fiction. 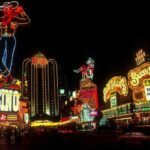 The Top Deck had 10-cent roulette, quarter craps, and 50-cent blackjack, and many unbalanced players – notice that polite term — to go along with that type of action. Like all break-ins learning to deal, I was happy to have a job, one I actually liked, although I lacked the psychology/sociology background, useful if not necessary for the Top Deck. As for a “fanned deck to the moon,” I also have an intimate knowledge as to what he was talking about. When I start playing craps, I usually start by placing the 6 and 8. If the point is already the established number of 6 or 8, I place one and bet the pass line with odds on the other. If both bets have equal money on them, which is the better payoff? Harry H.
You, Harry, like many players, complement their Pass line wager and odds with a Place bet on the 6 or 8. That’s smart gambling, because a Place bet is a wager with a small house advantage, 1.5%, and second, a Place bet can be made on some crap tables for as little as $6. Therefore, if the point is a six, yes, it is common to accompany your Pass line wager with an additional place bet on its kissing cousin, the 8. With taking odds, you are making a supplemental wager to your Pass line after the point is established. With this combination, you now have a Pass line bet and odds packaged. Still, it can be a costly adventure, far more so than merely placing a number and may check into the amount of disposable cash lining your pockets. Taking odds can be an expensive proposition, especially when dealing in multiples. So, pitting equally $30 placed on the Six, against $30 on the Pass line with odds ($10 place, $20 for double odds), your Place bet pays off at 7 to 6, or $7 for every $6 bet, making it a $35 dollar payday. Whereas, $10 on the Pass line gets you even money ($10) and your $20 double odds returns 6:5 on the 6 or 8, for an additional $24, totaling $34. Certainly, Harry, at first glance, your payout is higher on your Place bet, $35 vs. $34, but that does not mean it is a wise bet. Instead, you want the wager with the lower house edge, and that’s a Pass line bet with odds, (0.6% versus 1.5%), which can be considerably reduced with a minimum pass line wager and maximum odds.